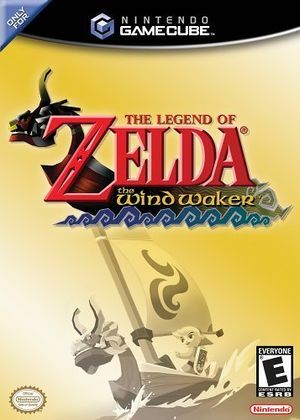 The Legend of Zelda: The Wind Waker, released as The Legend of Zelda: Baton of Wind (ゼルダの伝説 風のタクト Zeruda no Densetsu: Kaze no Takuto) in Japan, is an action-adventure game and the tenth installment in The Legend of Zelda series. The game is set on a group of islands in a vast sea—a first for the series. 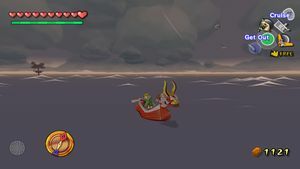 The player controls Link, the protagonist of the Zelda series, as he struggles to find his sister and save the world from Ganondorf. 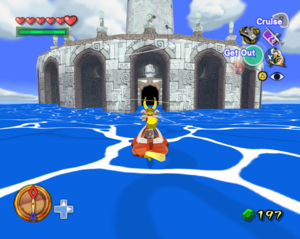 The Wind Waker follows in the footsteps of Ocarina of Time and its sequel Majora's Mask, retaining the basic gameplay and control system from the two Nintendo 64 titles. A heavy emphasis is placed on using and controlling wind with a baton called the Wind Waker, which aids sailing and floating in air. 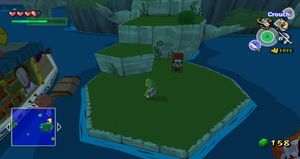 Though controversial during development for its use of cel shading graphics and the cartoon Link character, The Wind Waker was met with positive reception. The game will totally freeze/crash when snapping a photo with the Picto Box. Disable Store EFB Copies to Textures Only to correct this, though game may still briefly freeze when snapping photos. 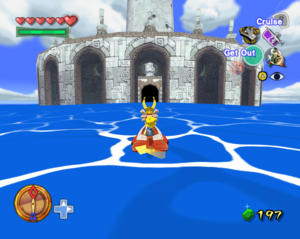 Like many official Nintendo games on GameCube and Wii, The Legend of Zelda: The Wind Waker uses mipmap levels to control some effects. As an enhancement, Dolphin uses higher mipmap levels further away as internal resolution increases to make textures look sharper. This breaks effects that rely on accurate mipmap levels. While support for detecting these cases was added in 5.0-5731 it requires the CPU texture decoders. As such, mixing high resolution output with GPU Texture Decoding will cause the wrong mipmap levels even after the fixes were added. Incorrect Mipmap levels cause the ocean's effects to draw far off into the distance. When drawn correct, the sea's effects fade to a deep blue further away from Link. The built-in Widescreen Hack causes clipping issues. The following AR/Gecko code works as a replacement, causing fewer issues. To avoid conflicts, make sure that Widescreen Hack is disabled while using these codes. At least the NA code causes a misalignment with the display of the magic bar and it's outline until it has been upgraded. The distance blur is built into the game, but to some, it looks off on higher resolutions. The blur can be disabled using Action Replay codes shipped with Dolphin. The graph below charts the compatibility with The Legend of Zelda: The Wind Waker since Dolphin's 2.0 release, listing revisions only where a compatibility change occurred. 2.0 Windows 7 Intel Core 2 Duo E6750 @ 2.66GHz NVIDIA GeForce 8800 GTS Playable! Sound becomes de-sync'd in some cutscenes. Occasionally freezes after cutscenes. Occasionally crashes. r6887 Windows Vista Intel Core 2 Duo T8100 @ 2.2GHz ATI Radeon HD 3470M Fully Playable: 30FPS with DX9 plug-in and OpenCL enabled. BGM is sometimes desynchronized. Windfall Island is a bit slow. r7309 Linux Intel Core 2 Duo E6400 @ 2.13GHz NVIDIA GeForce 9800 GT Playable most of time at 30FPS. Continuous graphics corrupts with "heat" effect (lava areas almost unplayable). 3.0 Windows 7 AMD Phenom II X4 965 @ 3.4GHz NVIDIA GeForce GT 220 Runs at 30±3FPS at 1600x900 with default Dolphin configuration except by setting Internal Resolution to Auto. Only experimented bug yet, fire effects glitches. 3.0 Mac OS X 10.7.3 Intel Core i5 @ 2.5GHz AMD Radeon HD 6630M Fully playable at full speed. Internal resolution at 2x native (1280x1056) and fullscreen resolution at 1920x1080. No glitches when playing at normal aspect ratio, but there are some pop-in issues at the edges when playing with the wide screen hack enabled. Otherwise flawless, and this game scales and runs beautifully. 3.0 Windows 7 Intel Core i5 @ 2.5GHz AMD Radeon HD Fully playable at full speed. Internal resolution at 2x native (1280x1056) and fullscreen resolution at 1920x1080. No glitches when playing at normal aspect ratio, but there are some pop-in issues at the edges when playing with the wide screen hack enabled. Otherwise flawless, and this game scales and runs beautifully. r7714 Windows 7 Intel Core i3-370M @ 2.4GHz AMD Radeon HD 6370M Fully playable: No slowdowns, no known glitches. 4.0.2 Windows 7 Intel Core i5-4570 @ 3.2GHz NVIDIA GeForce GTX 550 Ti Perfect performance across the board -- no slowdowns whatsoever. There are graphical flaws involving flames, but otherwise, the game didn't seem to have any noticeable glitches. Settings are Direct3D11, 2x native, 0xAA, 1xAF, JIT recompiler, and DSP HLE. 4.0-1720 Windows 7 Intel Core i5-3570K @ 3.8GHz NVIDIA GeForce GTX 680 Runs flawlessly on 30FPS with OpenGL at 4x Native resolution, 2x Anti-Aliasing and 4x Anisotropic Filtering. Minor lag at the beginning of the game (most likely objects being loaded) and during the water fountain eruption on Dragon Roost Island. 4.0-8961 Windows 10 Intel Core i5-6600K NVIDIA GeForce GTX 970 Smooth 60 FPS in Direct3D, with 1080p, AAx4 and forced AFx16. Some random slowdown. This page was last edited on 25 July 2018, at 01:45.